Normally, when you have trouble booting your system, it could be because of corruption in boot files. 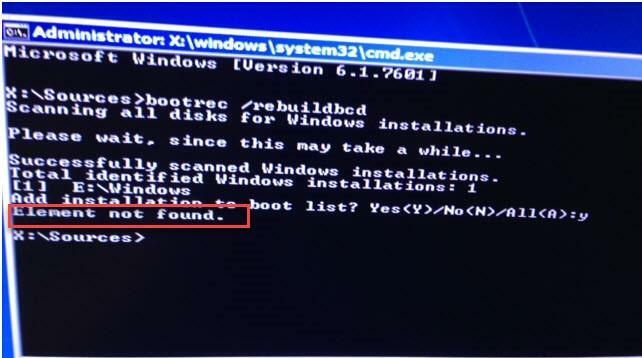 In order to solve this problem, users run ‘Bootrec’, ‘fixboot’, ‘RebuildBCD’ and similar commands through the command prompt. What these commands do is they repair the boot files and rebuild the boot configuration data. If these commands run successfully, you will be able to repair the errors and boot into your system without any issues. However, due to various reasons, these commands could fail and produce error messages like ‘Element not found’. In order to solve this problem, it is important to identify the root cause of the problem. And this article will help do that and also resolve the problem. So read on to find the reasons for the error ‘Element not found’ as well as corresponding solutions. A system partition is the first logical partition on your hard drive which contains the boot loader. This boot loader is a software required to boot the operating system. And it is important that this partition is set to ‘Active’ if you want your system to boot properly. If this setting is not appropriate, your system may not boot and you may see errors while performing Bootrec/Fixboot. You will need a Windows installation disc to perform this troubleshooting step or you will need to access the Advanced Startup Options menu by hitting F11 key while booting your system. Under the list of partitions, identify the system partition, which is usually around 100MB in size. Then type the following commands and hit Enter. Startup Repair is a built in tool that can be used to repair startup issues in your computer. You can either access this repair feature through the Windows installation disc or through the Advanced Startup menu (usually accessed by hitting F11 key when booting your system). Now, the system will perform a repair process to repair any inherent issues. Once the repair is complete, your issue should be resolved. Using the same steps as explained in Solution 1, enter the command prompt and then type the following commands and hit Enter after each of them. After executing these commands, type ‘exit’ to exit the command prompt. Now, your issue should be resolved. However, if none of these solutions helped you solve the error, then it is a good idea to recover data from the drive and then further proceed with the troubleshooting process because you do not want to risk losing your precious data. In such situations, you can make use of Yodot partition recovery software to recover data after MBR corruption. It has the ability to recover files in the same manner as original; with the same file names and folder structure. This partition recovery software also has the ability to recover files from an active partition. Give this tool a try and see how effectively it can recover your partitions.